For the film, see The Mod Squad (film). For the tag team, see The MOD Squad (professional wrestling). For the NASCAR racing division in the Northeast with the nickname, see Whelen Modified Tour. The Mod Squad is an American crime drama series that ran on ABC from 1968 to 1973. It starred Michael Cole as Peter "Pete" Cochran, Peggy Lipton as Julie Barnes, Clarence Williams III as Lincoln "Linc" Hayes, and Tige Andrews as Captain Adam Greer. The executive producers of the series were Aaron Spelling and Danny Thomas. The counterculture police series earned six Emmy Award nominations, four Golden Globe nominations plus one win for Peggy Lipton, one Directors Guild of America Award, and four Logies. In 1997, a 1970 episode "Mother of Sorrow" was ranked #95 on TV Guide's 100 Greatest Episodes of All Time. They were The Mod Squad ("One black, one white, one blonde"), described by one critic as "the hippest and first young undercover cops on TV". Each of these characters represented mainstream culture's principal fears regarding youth in the era: long-haired rebel Pete Cochran was evicted from his wealthy parents' Beverly Hills home, then arrested and put on probation after he stole a car; Lincoln Hayes, who came from a family of 13 children, was arrested in the Watts riots, one of the longest and most violent actual riots in Los Angeles history; flower child Julie Barnes, the "canary with a broken wing,":64 was arrested for vagrancy after running away from her prostitute mother's San Francisco home; and Captain Adam Greer was a tough but sympathetic mentor and father figure who convinced them to form the squad. The concept was to take three rebellious, disaffected young social outcasts and convince them to work as unarmed undercover detectives as an alternative to being incarcerated themselves. Their youthful, hippie personas would enable them to get close to the criminals they investigated. "The times are changing," said Captain Greer. "They can get into places we can't." Examples included infiltrations of a high school to solve a teacher's murder, of an underground newspaper to find a bomber, and of an acting class to look for a strangler who was preying on blonde actresses. The show was loosely based on creator Bud "Buddy" Ruskin's experiences in the late 1950s as a squad leader for young undercover narcotics cops, though it took almost 10 years after he wrote a script for the idea to be given the greenlight by ABC Television Studios. Linc's famous "solid" and "keep the faith" were among the current-day slang used on the show, which included "pad", "dig it", and "groovy." The "kids" traveled in Pete's famous "Woody", an old green 1950 Mercury Woodie station wagon, until it burned up in a fire after going over a cliff during a chase at the end of the second season episode "The Death of Wild Bill Hannachek". Among the series guest stars were Spelling's ex-wife Carolyn Jones, Leslie Nielsen, William Windom, Ed Asner (three episodes in three different roles), Vincent Price, Sammy Davis Jr. (three episodes in three different roles), Andy Griffith, Joe Don Baker, David Cassidy, Richard Pryor, Lee Grant, Richard Dreyfuss (two episodes in two different roles), Jo Van Fleet, Tom Bosley, Marion Ross, Danny Thomas (as well as being co-executive producer of the show), Tyne Daly (two episodes in two different roles), Anthony Geary. Sam Elliott, Martin Sheen, Desi Arnaz Jr., René Auberjonois, Stefanie Powers, Robert Reed, Cesar Romero, Meg Foster (two episodes in two different roles), Jack Cassidy, Tony Dow, Vic Taybeck, Fritz Weaver, Clint Howard, Louis Gossett, Jr., Sugar Ray Robinson, Bobby Sherman (two episodes in two different roles), Billy Dee Williams, Victor Buono, Jim Backus, Fernando Lamas, Cleavon Little, Daniel J. Travanti (three episodes in three different roles), Barbara McNair and Rodolfo Hoyos, Jr. (three episodes in three different roles). In the U.S., MeTV reran the series from May 26, 2014 to August 29, 2014 and again on Sunday afternoons from January 4, 2015 to August 30, 2015. The Decades Network rerun part of the series on the 24th and 25 February 2018 for their binge weekend. A television pilot was shot in 1968, with a running time of 74 minutes, but it was never aired in its entirety. The film was edited to 50 minutes and aired as the show's first episode. The uncut 74-minute version appears on the DVD set as the opening episode, "The Teeth of the Barracuda". A TV reunion movie, The Return of Mod Squad, aired on ABC May 18, 1979, featuring the entire original cast. In 1999, the series was adapted into a film with the same title by MGM starring Giovanni Ribisi, Omar Epps, Claire Danes, and Dennis Farina. The film was not a box-office success. CBS DVD (distributed by Paramount) has released the first two seasons of The Mod Squad on DVD in Region 1. On August 20, 2013, it was announced that Visual Entertainment had acquired the rights to the series (under license from Paramount) and would release season 3 on DVD on September 24, 2013. Season 4 would be released on October 1, 2013. In Canada, Season 3 was released on DVD a week earlier, on September 17, 2013, and Season 4 was released on October 8, 2013. Season 5 was released in Canada on November 19, 2013 and in the US on December 17, 2013. A complete series set was released in Canada and the US on November 12, 2013. The term "Mod Squad" was introduced the previous year in Dragnet 1967, episode 16 "The Big Kids", where it describes a club of highschoolers who must shoplift at least $20 to become members. The Mod Squad is referenced by the Thing in "Chapter Three: Through The Negative Zone!" of Deadpool (vol. 4) #20: "'Hey, who wants a clobbering? I'm watching The Mod Squad." 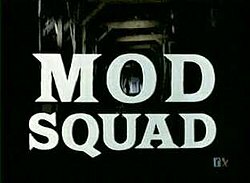 An additional editor's note was attached to the reference which explained, "**Ed's Note: The Mod Squad was a popular TV show. TV was what people called YouTube in 1968." The Mod Squad was parodied during its debut season as "The Odd Squad" by Mort Drucker in MAD Magazine #127 (June 1969), and at the height of its third season by Marie Severin as "The Clod Squad" in Marvel Comics' SPOOF #1 (October 1970). In The Wonder Years pilot episode, the off-screen narrator sets the scene, with a 20-year hindsight, by saying: "1968, I was 12 years old. A lot happened that year..." The screen shows snapshots of Martin Luther King Jr., Robert F. Kennedy (both assassinated that year), the Black Power Salute, anti-Vietnam war protests, Apollo 8 space mission (the first manned lunar orbital flight) and other historic events and figures of 1968. However, the narrator goes on to list only three events that were, apparently, more important to him as a 12-year-old at that time: "... Denny McLain won 31 games, The Mod Squad hit the air, and I graduated from Hillcrest Elementary and entered junior high school". In 1990 on the TV series Twin Peaks, in which Lipton was a regular, Williams appeared in two episodes. In 2000, the TV series That 70's Show—Season 2, Episode 19, entitled "Parents Find Out"—references The Mod Squad. In Kelso's van, Kelso tells Hyde and Fez that he has a CB radio, and runs some possible names by them. A girl comes on the radio and says that her name is Foxy Lady, and she is with her friend, Nice 'N Easy. Fez comments that the girls sound nice; Kelso says that they need handles before they can answer, and Hyde suggests that they be "The Mod Squad"; they argue over who is going to be Linc, but Hyde wins out (due to his Afro), leaving Kelso as Pete and Fez as Julie. It was also mentioned in the 1992 comedy Sister Act by Whoopi Goldberg as Sister Mary Clarence. ^ a b c d "The Mod Squad". St. James Encyclopedia of Popular Culture. ^ a b Lovece, Frank (December 16, 2007). "Groovy kind of law". Newsday. Archived from the original on February 15, 2008. ^ "Awards for The Mod Squad". Internet Movie Database. Retrieved April 28, 2017. ^ "Special Collectors' Issue: 100 Greatest Episodes of All Time". TV Guide (June 28-July 4). 1997. ^ Hutchings, David (April 4, 1988). "Can You Dig It? the Mod Squad's Peggy Lipton, One Marriage and 15 Years Later, Returns to Acting". People. Vol. 29 no. 13. Retrieved April 28, 2017. ^ Debolt, Abbe A.; Baugess, James S., eds. (2011). Encyclopedia of the Sixties: A Decade of Culture and Counterculture [2 volumes]: A Decade of Culture and Counterculture. ABC-CLIO. p. 629. ISBN 9781440801020. Retrieved June 10, 2014. ^ a b c d Spelling, Aaron; Graham, Jefferson (2002). Aaron Spelling: A Prime-Time Life. Macmillan. ISBN 9780312313449. ^ a b c Madden, Joanne (May 17, 2011). "The Coolness of The Mod Squad". TV Banter. Retrieved February 8, 2015. ^ a b "The Mod Squad - Season 1, Volume 1". Amazon.com. Retrieved February 8, 2015. ^ Blythe, Kambur O. "The Mod Squad: The Second Season, Volume One". GameVortex.com. GameVortex Communications. Retrieved February 8, 2015. ^ Allen, Steve. "Television in the United States". Britannica.com. Retrieved February 8, 2015. ^ The Star Trek episode "Plato's Stepchildren", often cited as a controversial 'first' of this kind, was not until 1968. ^ "'Mod Squad' Star Returns to TV". Los Angeles Times. Times Wire Services. October 19, 1990. Retrieved February 8, 2015. ^ "No. 12: Classic TV Beauties 1960s Countdown: Peggy Lipton as Julie Barnes in "The Mod Squad"". ClassicTVBeauties.com. Retrieved February 8, 2015. ^ Thomlison, Adam. "Q&A". TV Media. Retrieved September 24, 2015.